Colonies on the moon or Mars could use synthetic biology to produce food, fuel, medicines and building materials. Credit: Journal of the Royal Society Interface. (Phys.org) —Genetically engineered microbes could help make manned missions to Mars, the moon and other planets more practical, according to a new analysis by UC Berkeley and NASA scientists. 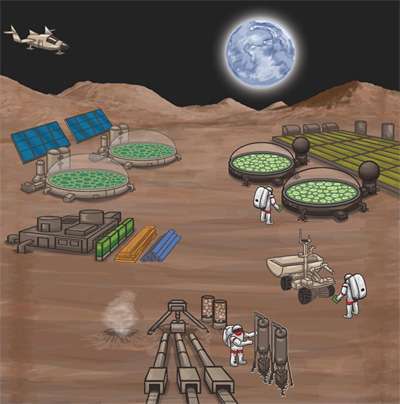 In the cover story of today's issue of the Journal of the Royal Society Interface, four bioengineers describe how synthetic biology – what some have termed "genetic engineering on steroids" – could allow space travelers to use microbes to produce their own fuel, food, medicines and building materials from raw feedstocks readily available on Mars or the moon, instead of carrying all supplies aboard the spacecraft or making them at the destination with conventional non-biological methods. "Our analysis indicates that (synthetic biology) has a good chance of being a disruptive space technology by providing substantial savings over current techniques," said first author Amor Menezes, a postdoctoral scholar in UC Berkeley's California Institute for Quantitative Biosciences (QB3). "One goal of our paper is to advocate for an expanded role for synthetic biology in space science, with a view toward future mission deployment." Menezes coauthored the paper with Adam Arkin, professor of bioengineering and division director of physical biosciences at Lawrence Berkeley National Laboratory, and John Cumbers and John A. Hogan of NASA Ames Research Center in Mountain View, Calif. While NASA Ames is now studying the role that synthetic biology might play in manned space missions, most plans for interplanetary travel are being drawn up by aerospace engineers who envision carrying large amounts of food, fuel and other raw materials for a round-trip journey to Mars, with the necessary supplies replenished by production on the Martian surface. That involves a lot of supply and equipment weight to lift off Earth and across the millions of miles between Earth and Mars. In their study, the scientists calculate that using biological production could reduce the mass of supplies and equipment sent with the expedition by between 26 and 85 percent, depending on the application, which would significantly reduce the cost of the mission. Engineered biology could also make the suggested biomass-based food taste better. They identify specific microbes that in their natural or bioengineered state could take in resources from mission waste and the Martian atmosphere – carbon dioxide, nitrogen, hydrogen and oxygen, for example – to produce necessities. They estimate that for a 916-day Martian mission, the bacteria Methanobacterium thermoautotrophicum could produce enough high-quality methane and oxygen for fuel to reduce the mass of a Martian fuel manufacturing plant by 56 percent. Biomass generation with Arthrospira platensis and Arthrospira maxima could decrease the shipped wet-food mixed-menu mass for a Mars stay and the return voyage by 38 percent. Polyhydroxybutyrate synthesis with Cupriavidus necator would allow astronauts to produce the raw material for 3-D printing, lowering the shipped mass needed to make a 120 cubic meter, six-person, 3-D printed habitat by 85 percent. An engineered species of the bacterium Synechocystis could replenish stocks of the anti-inflammatory medication acetaminophen in just a few days. Many drugs have a reduced shelf life because of radiation in space. "Space synthetic biology is truly ground-breaking," Menezes said. "Abiotic technologies were developed for many, many decades before they were successfully utilized in space, and biological technologies like synthetic biology are only now seeing development efforts. So, of course these technologies have some catching-up to do when utilized in space. But it turns out that this catching-up may not be that much, and in some cases, the technologies may already be superior to their abiotic counterparts." "In the future, the biological technologies will have to be deemed 'safe' for the astronauts and the extraterrestrial destination, with suitable containment efforts in place," he said. "You may even see some biological technologies on the first long-duration manned voyage." For more detail, read a Q&A with Menezes on the Royal Society Publishing blog. Yeah, they can send away all their politically correct slow-poke germ-fueled boats for all I care. I'll just disinfected them and their stupid lackeys with my nuclear exhaust a few times back and forth between planets while they are still crawling along to nowhere at a snail's pace. F**k the NPT!